If you visit the perfomance of the gipsy show “Kusturica” you can see with your own eyes and not from TV screens the dizzying round dance of colorful dresses, incendiary hoppings, feel the energy, passion and the wonderful world of gipsy romance, love, beauty and freedom. During the work these talented artists the were admired not only in Belarus. The performances of hot gipsy musicians and attractive black-eyed gipsies with their songs and dances have become famous from Paris to Dubai. Throughout its existence the collective became the laureate and the winner of international competitions of gipsy art, the finalist of “Evrovision – 2015”. The beauty of the gipsy culture is so attractive that it’s may burn gipsy fire even in the souls of pure blood slavic people. The show “Kusturica” is distinguished by the absence of patterns in genres, standards and stereotypes. 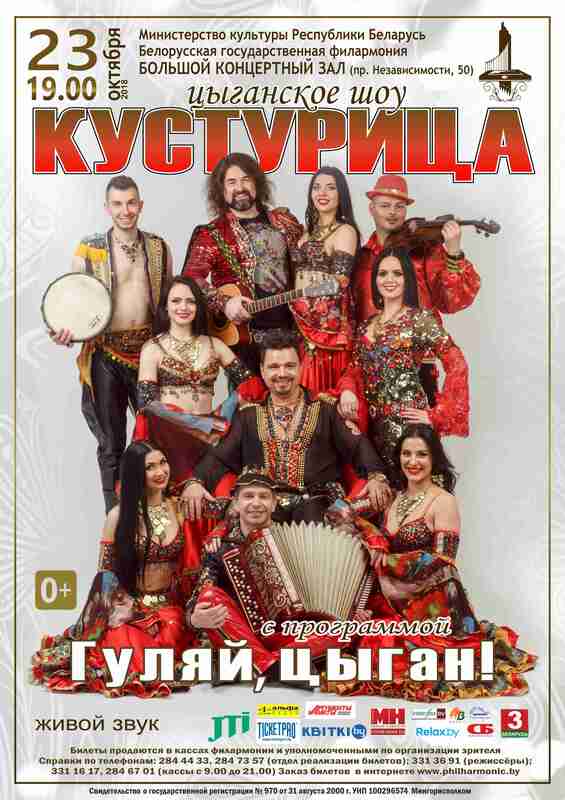 The repertoire consist of harmonious mixture of Arabic and Gipsy, Balkan and Bessarabian music, motifs of Russian and Romanian gipsies, gipsy chanson. From classics to popular hits – anything and everything that you like and want to hear! At the same time the program of the solo concert is planed according to the detailed scenario, which develops and charges the viewer with his mood.